Avenatti: Junior Will Be Indicted By The End Of 2018 - Joe.My.God. Just two days ago, attorney Michael Avenatti tweeted that Donald Trump Jr. will be indicted, in a response to a tweet that Trump Jr. made mocking the idea that Avenatti could run for President. This garnered a lot of attention from the public, as Avenatti has consistently been a thorn in President Trump’s side over the past couple of years. 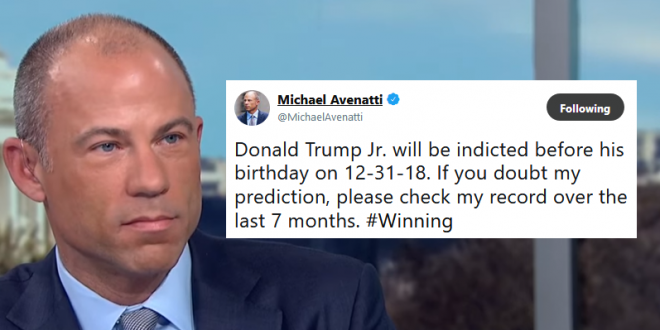 Now, Avenatti is taking his prediction a step further, with another tweet this morning, adding details to his claim that Don Jr. will eventually end up with criminal charges on his plate.